I’m seeing news on the internet — though not confirmed by any news organizations yet — that former Soft Machine bassist Hugh Hopper has died. His Wikipedia entry, which mentions his year-long struggle with leukemia, gives the date as “June 2009.” No additional information is available on his official website. 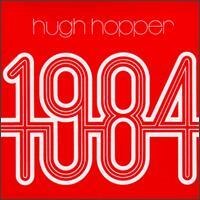 Hopper’s 1973 album 1984 has long been a favorite of mine. His first solo album after leaving the Soft Machine, 1984 combines Hopper’s excellent jazz playing with some experimental processes, especially tape loops, to great effect. It’s fitting that this album, based on the futuristic novel by George Orwell, still sounds ahead of its time. This entry was posted in Download, Obituary on June 8, 2009 by othersideoflife. The Los Angeles Free Music Society (LAFMS) has been, since the early 1970s, the banner heading of a loose collective of experimental musicians in Los Angeles, California who were joined by an aesthetic based around radicalism and playfulness. Key players have included Joe Potts, Tom Recchion, Joseph Hammer, John Duncan, Dennis Duck and Rick Potts. Notable band configurations have included Le Forte Four, Smegma (who relocated to Portland, OR in the early 1980s), Solid Eye, Airway and Doo-Dooettes. Their influence was most immediately felt by Japanese noise musicians like Hanatarash and Incapacitants. This collection was curated/compiled by Darren Misner, one of the original Pataphysics Lab founders, for me a few years ago, and I just thought that, at this late date, I should share. Many thanks to Darren for this and many other fine gifts through the years. This entry was posted in Download and tagged Airway, Chip Chapman, Dennis Duck, Dinosaurs With Horns, Doo-dooettes, Download, Extended Organ, Fredrik Nilsen, Friends of Leslie, Harold Schroeder, Human Hands, Kevin Laffey, Le Forte Four, Los Angeles Free Music Society, Monique et Aviv, Monitor, Paul Is Dead, Rick Potts, Solid Eye, Tom Recchion on March 15, 2008 by othersideoflife. We are sad to announce that Sean Finnegan, the drummer from Void and an original member of the Dischord family, passed away on Wednesday January 30th of an apparent heart attack, he was 43. This entry was posted in Obituary and tagged Dischord, Sean Finnegan, Void on February 4, 2008 by othersideoflife. Stockhausen, who gained fame through his avant-garde works in the 1960s and ’70s and later moved into composing works for huge theaters and other projects, died Wednesday, Germany’s Music Academy said, citing members of his family. No cause of death was given. Stockhausen was considered by some an eccentric member of the European musical elite and by others a courageous pioneer in the field of new music. Rock and pop musicians such as John Lennon, Frank Zappa and David Bowie have cited him as an influence, and he is also credited with having influenced techno music. Stockhausen sparked controversy in 2001, when he described the Sept. 11, 2001, attacks in the United States as ”the greatest work of art one can imagine” during a news conference in the northern German city of Hamburg, where several of the suicide pilots had lived. The composer later apologized, but the city still canceled performances of his concerts. While not one of my favorites, the man was still a major force in 20th Century music, and he certainly influenced many others as well (some in what not to do). Probably none so vividly as his one-time assistant Cornelius Cardew, who later rebelled against his father figure in his famous Stockhausen Serves Imperialism tract (available for download here). This entry was posted in Obituary and tagged Cornelius Cardew, Karlheinz Stockhausen on December 7, 2007 by othersideoflife. Sharkey and Richie from Clockcleaner in front of the Louisville Slugger bat, 10/30/07. The Jesus Lizard Cover Band at the Pour Haus, 10/26/07. Nick gets wild in Lexington. 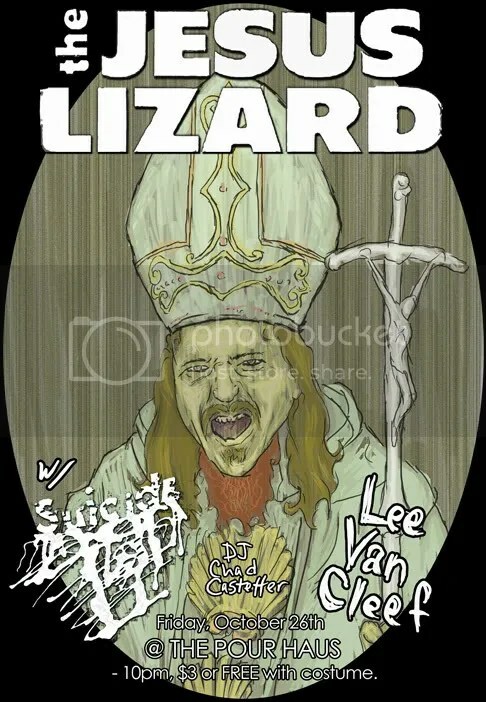 This entry was posted in Activities, Photographs and tagged Clockcleaner, Jesus Lizard, Louisville Slugger, Nick, Pour haus, Richie, Sharkey on November 7, 2007 by othersideoflife. Harley Gaber’s The Winds Rise In the North Reissue! How endlessly the heavens turn. And yet the earth remains at rest. Do the sun and the moon quarrel as to their positions? Who rules over and orders all these things? By whom are they in harmony? Who effortlessly causes and maintains them? that prevents them from being other than as they are? Must the heavenly bodies move as they do, powerless to do otherwise? Look how the clouds drop the rain! And how the rain rises again to form the clouds! Who moves them to this abundance? Who effortlessly produces the primary orb and stimulates it? The winds rise in the north and blow to the east and west. Who effortlessly causes them to blow? This is fantastic news for fans of post-Theatre of Eternal Music drone, as well as downtown music in general, as this classic has been out of print for quite a long time. The Winds Rise In the North was originally released on Titanic Records in 1976, and according to Alan Licht‘s Minimalism Top Ten III over at Volcanic Tounge, “Gaber gave up music not long after this record to pursue a career as a tennis instructor (! )….” Nutty. Anyways, a favorite in my household for some years now (purchased from Bob Fay on eBay, heh), it’ll be nice to see this relatively unheard classic get a new leash on life (and hopefully up-to-date mastering). This entry was posted in New Releases and tagged Alan Licht, Bob Fay, Edition RZ, Harley Gaber, Malcolm Goldstein, Minimalism Top Ten, Titanic Records, Volcanic Tounge on September 15, 2007 by othersideoflife. Funnily enough, the last track on the record, “Landing Back on the Shore [By Morning],” isn’t really drony at all, but since it’s the shortest, it’s what I’ve decided to upload. This song is unlike the other two on Air Traffic Control Sleep, but don’t let that deter you. You can buy Air Traffic Control Sleep direct from Insect Fields here (for cheap!). Barsky is also a member of/contributor to D.C.’s excellent Kohoutek, who will be soon releasing a new CD entitled Expansive Headache on Music Fellowship shortly. In the meantime, here is their self-titled two-song CDr from 2005, unfortunately Barsky-less, but still worth your time (disclaimer: I booked a Kohoutek/Mouthus show in the fall of 2005). And if you happen to live in the Washington, D.C. area, you can catch another Barsky band Civilians on September 18th (with Eddy Current Suppression Ring), Insect Factory on September 20th (as part of the Sonic Circuits festival), and Kohoutek on September 28th (with Alasehir and Suishou No Fune), all at the Velvet Lounge. In an unrelated note, I will be moving at the end of the month, so posts may become infrequent. I know all two of my readers will be upset, but that’s the way it goes. This entry was posted in Record Review and tagged Alasehir, Civilians, Eddy Current Suppression Ring, Insect Factory, Kohoutek, Mouthus, Phill Niblock, Rafael Toral, Suishou No Fune on September 14, 2007 by othersideoflife.